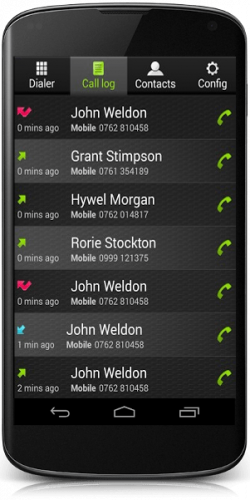 We have had many requests for VoIP soft phones which are compatible with smart phones such as iPhone, Android and Windows phones, which are also compatible with A2Billing and can be branded and white-labelled. We have worked with a major soft-phone programmer and distributor to check that their phones are compatible and we have written a module to display the balance in the VoIP dialer application. The softphones can be branded, have features added and removed to suit the customer’s requirements, and can easily be provisioned with a QR code displayed on a web page or on advertising material. For more information please click softphones for smartphones or contact us for more details. This entry was posted in A2Billing News and tagged android, iPhone, SIP dialer, Smartphone, windows phone. Bookmark the permalink.